Masters Walleye Circuit – Page 5 – Great Walleye Tournament Fishing Starts Here! Ponca City, Okla.—June 27, 2018—Walleye anglers who enjoy fast action, exciting competition and hefty payouts are invited to join the fun when the Cabela’s Masters Walleye Circuit ventures north to sample the legendary walleye fishery of Lake of the Woods with a regular season tournament presented by Ranger Boats July 13-14. Headquartered at scenic Border View Lodge out of Baudette, Minnesota, the two-day event offers two-person teams a chance to test their skills while competing for thousands in cash and prizes in the MWC’s time-tested, professionally run format. Teams will be allowed to bring their best five fish to the scale each day, and the team with the highest two-day total weight will be crowned the Lake of the Woods champions. The Cabela’s MWC’s lucrative payouts, which are based on the number of teams entered in each event, provide even more inspiration to join the fun. In addition, the MWC big-fish pot, option pot payouts and sponsor bonuses including Ranger Cup, Lowrance Electronics, Okuma, AirWave and T-H Marine Atlas Awards add thousands more to the total. Plus, the first-place team wins a $1,000 Cabela’s National Team Championship Prize Package including paid NTC entry, travel stipend, team jerseys and plaques. Such winnings add up. At the recent Lake Francis Case MWC tournament, for example, first-place finishers Doug Lovro and Todd Henle of Sioux Falls, South Dakota, were rewarded with $18,658 in cash and prizes. Walleye fans of all ages are invited to catch the excitement at the daily weigh-ins, which begin at 3 p.m. at Border View Lodge. If you can’t make it in person, watch the weigh-ins live, online, at masterswalleyecircuit.com. The 2018 tournament schedule includes eight qualifiers in seven states, plus the 2019 Cabela’s MWC World Walleye Championship. Registration for 2018 events is now open, and the deadline for registering for the Lake of the Woods tournament is Monday, July 9 at 4 p.m. Visit masterswalleyecircuit.com for updates, official rules and registration information. 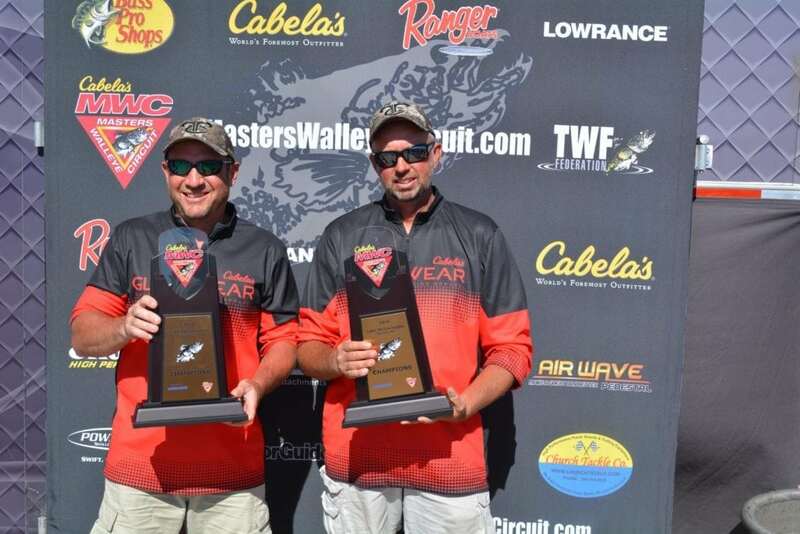 Ogallala, Neb.—June 2, 2018—Nebraskans John Miller and Ev Tarrell started fast and finished strong to score an emotional victory at the Cabela’s Masters Walleye Circuit’s regular season tournament on Nebraska’s mighty Lake McConaughy out of Ogallala, Nebraska, June 1-2, 2018. Presented by Lowrance Electronics and headquartered at scenic Cedar Vue Campground, the two-day event featured 160 anglers from 12 states fishing in two-person teams for their share of more than $60,000 in cash and prizes. Their daily total plummeted to 10 pounds, 13 ounces. But the rest of the hard-fishing MWC field also struggled to adapt to the changing conditions and, as fate would have it, Miller and Tarrell’s 35-pound, 12-ounce tournament total was enough to win the day by nearly three pounds. 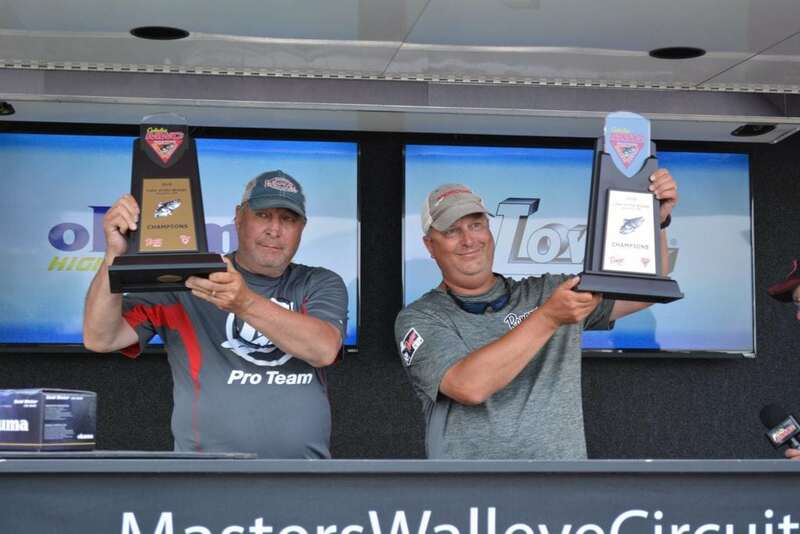 Miller and Tarrell collected $17,450 in cash and prizes for their efforts, including the $12,000 first-place cash payout, $3,750 cash from the option pot, $500 AirWave certificate, $200 Okuma Reel bonus and a $1,000 Cabela’s National Team Championship Prize Package including paid entry into the Cabela’s NTC, travel stipend, team jerseys and plaques. In all, the Cabela’s MWC awarded $61,280 in cash and prizes. A total of 424 walleyes weighing 1,149 pounds, 6 ounces crossed the scale during the event. Big fish was a 9-pound, 10-ounce trophy caught on day two by Brian and Jeremy Tordsen. Adding to the fun, the Cabela’s MWC and National Professional Anglers Association presented a Youth & Family Fishing Clinic immediately after the day-one weigh-in, with participating youths receiving rod-and-reel combos courtesy of the NPAA. 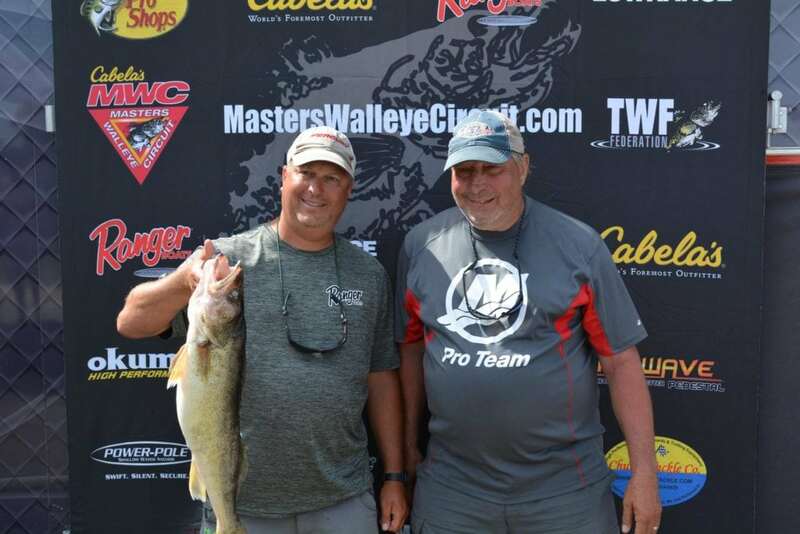 Headquartered at scenic Cedar Vue Campground, the two-day event offers two-person teams a chance to enjoy “Big Mac’s” world-class walleye fishery while competing for thousands in cash and prizes in the MWC’s time-tested, professionally run format. Weather permitting, teams will enjoy two full days of competition. Teams will be allowed to bring their best five fish to the scale each day, and the team with the highest two-day total weight will be crowned the Lake McConaughy champions. Walleye fans of all ages are invited to catch the excitement at the daily weigh-ins, which begin at 3 p.m. at Cedar Vue Campground. If you can’t make it in person, watch the weigh-ins live, online, at masterswalleyecircuit.com. The 2018 tournament schedule includes eight qualifiers in seven states, plus the 2019 Cabela’s MWC World Walleye Championship. Registration for 2018 events is now open, and the deadline for registering for the Lake McConaughy tournament is Monday, May 28 at 4 p.m. Visit masterswalleyecircuit.com for updates, official rules and registration information.